Viagogo are in the news again, so I took a quick look at their site. 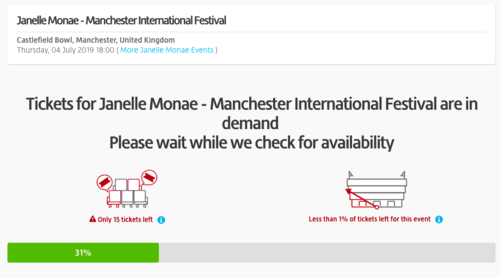 I saw that they are selling tickets – “Only a few tickets left” (on their site says the tiny popover) – for Janelle Monáe at the Manchester International Festival for £75 and up, even though tickets are still available from the official site at their face value of £35 (I also have a spare ticket, get in touch if interested, face value!). So far, so expected. To sum that up, it is a loop, starting at 10 and counting up to 100 every 700ms, doing nothing much apart from increase the progress bar. When it gets to 100, it sets a cookie and emits an event that is listened to elsewhere, causing the page to update and move on. It says “Please wait – This may take a few minutes”. Near the end of your wait, you get a message saying “Thank you for waiting – you'll be redirected shortly” And very near the end it changes to a green tick. 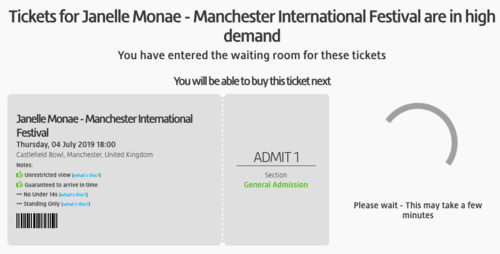 By trying a few different performers, I discovered that whilst the first page always seemed to currently use 63s as its wait time (10-100, 700ms per iteration), the waiting room time varies by performer – it was 90 seconds total for Janelle Monáe, but only 73.8 seconds for Elton John. I assume this is how the site manages demand in some way, by varying the wait time for people as the site gets busier (or something like that), but it seems a very artificial way of doing it.